Most digital I/O boards can not be directly interfaced to real world devices. Output voltages are usually limited to TTL levels (0/5 Vdc) with a few milliamps of drive current. Inputs are also typically limited to a maximum 5 volt level. 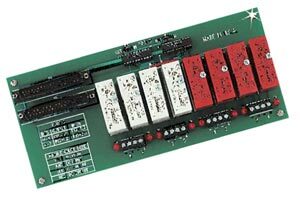 When higher voltages or currents are needed, OMEGA's solid state I/O modules are the perfect solution. Models are available for input or output signals in AC and DC voltage versions. The SSR-RACK series is a family of backplanes that accept the solid state I/O modules and provide a direct connection to OMEGA's CIO family of digital I/O PC plug-in boards. Three models are available; the SSR-RACK48, SSR-RACK24 and SSR-RACK08 which are 48, 24 and 8 channel models respectively.